(CNN) -- Republican vice presidential nominee Gov. Sarah Palin vowed on Tuesday to use her executive experience to tackle government reform and energy independence if she and Sen. John McCain win this year's presidential election. Alaska Gov. Sarah Palin speaks with CNN's Drew Griffin Tuesday. "It's going to be government reform because that, that is what I've been able to do as a mayor and as a governor, you, you take on the special interests and the self-dealings. Yep, you ruffle feathers and you have the scars to prove it," Palin said Tuesday in an interview with CNN's Drew Griffin. "You have to take that on to give the American people that faith back in their own government. This is their government and we've got to put it back on their side," she said. "That's been my forte as the governor of an energy producing state and as a former chair of the, of the energy regulator -- entity up there in Alaska," she said. "[I] look forward to that and that's a matter of national security and, and our economic prosperity opportunities." Palin also said helping families with special needs children and cleaning up Wall Street were among the other "missions" she and McCain had discussed. Palin emphasized her executive credentials as mayor of Wasilla, Alaska, and governor of Alaska, contrasting them with what she said was Sen. Barack Obama's lack of leadership experience. Palin also apologized Tuesday for any misunderstanding caused when she referred last week to the patriotic values of "the real America" and "pro-America areas of this great nation." Democrats and others criticized Palin for seeming to imply that some parts of the country are more patriotic than others. 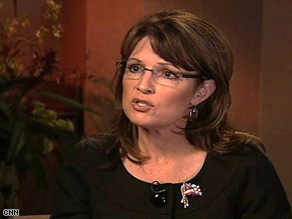 Palin denied that was her intention in an interview with CNN on Tuesday. "I don't want that misunderstood," Palin said. "If that's the way it came across, I apologize." The Alaska governor made the remarks at a fundraising event in North Carolina last week. "We believe that the best of America is in these small towns that we get to visit, and in these wonderful little pockets of what I call the real America, being here with all of you hard-working, very patriotic, very pro-America areas of this great nation," she told the crowd. Could 'Palin factor' save McCain? On Tuesday, Palin also addressed Democratic vice presidential nominee Sen. Joe Biden's comment that Sen. Barack Obama would be tested from the very beginning of his time in office. At a fundraiser Sunday night, Biden said that after taking office, "it will not be six months before the world tests Barack Obama like they did John Kennedy. ... We're going to have an international crisis, a generated crisis, to test the mettle of this guy." Biden's point, according to a statement issued later, was that "we need steady leadership in tumultuous times, not ... the stubborn ideology of John McCain." Palin stopped short of labeling Obama a socialist Tuesday, although she and others have previously called his tax policies socialist. "I'm not going to call him a socialist, but as 'Joe the Plumber' has said, it looks like socialism to him," she said of Joe "the plumber" Wurzelbacher. The GOP ticket and their supporters have invoked Joe the Plumber numerous times ever since the Ohio man confronted Obama about his tax policy in an impromptu campaign moment. Palin said Wurzelbacher is representative of "Jane the engineer and Molly the dental hygienist and Chuck the teacher." Obama defended his decision to raise taxes on couples earning more than $250,000 a year while cutting taxes for people with lower incomes, telling Wurzelbacher that "when you spread the wealth around, it's good for everybody." Obama brushed off McCain and Palin's characterization on Sunday in Fayetteville, North Carolina. "John McCain thinks that giving these Americans a break is socialism," Obama said. "Well, I call it opportunity, and there is nothing more American than that."